A set of woodworking chisels. The definition of a chisel is a hand tool with a wedge shaped blade that is driven with a mallet or hammer. 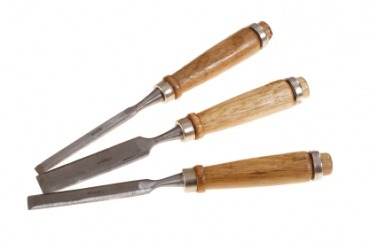 The tool used for making details in wood, stone or metal is an example of a chisel. Chisel means to shape or cut a hard material using a hand tool called a chisel. Sculpting detail work from stone using a chisel is an example of to chisel. "chisel." YourDictionary, n.d. Web. 20 April 2019. <https://www.yourdictionary.com/CHISEL>. to take advantage of by cheating, sponging, etc. To shape or cut with a chisel. Middle English from Old French cisiel from Vulgar Latin cīsellus cutting tool from diminutive of Latin caesus past participle of caedere to cut ; see kaə-id- in Indo-European roots. 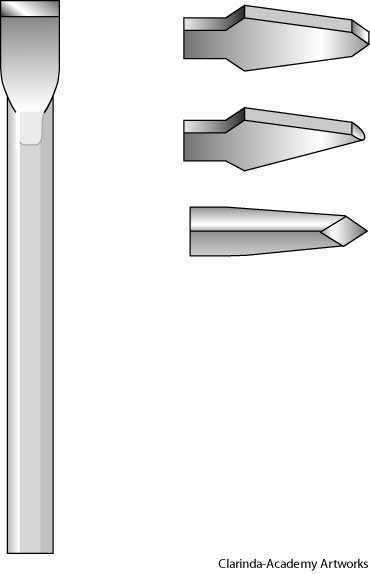 A cutting tool consisting of a slim oblong block of metal with a sharp wedge or bevel formed on one end. It may be provided with a handle at the other end. It is used to remove parts of stone, wood or metal by placing the sharp edge against the material to be cut and pushing or pounding the other end with a hammer, or mallet. To work something with a chisel. (intransitive, informal) To cheat, to get something by cheating. chiselling and chiselled are more common in the UK while chiseling and chiseled are more common in the US. From Old French cisel (French ciseau), from Vulgar Latin *cisellum, from Latin caesellum, from caesus, past participle of caedere (“to cut”). What would inspire someone to chisel their name into a rock so far from civilization? After a few more turns of the lathe he removed his foot from the pedal, wiped his chisel, dropped it into a leather pouch attached to the lathe, and, approaching the table, summoned his daughter. In the former the upper tusks are bent down so as to cross the tips of the short and chisel-like lower pair.